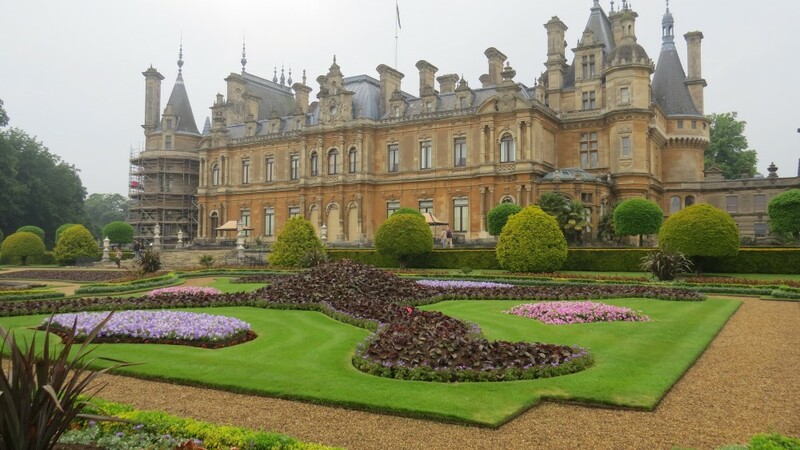 Waddesdon Manor – Carpet-Bedding and Koons? 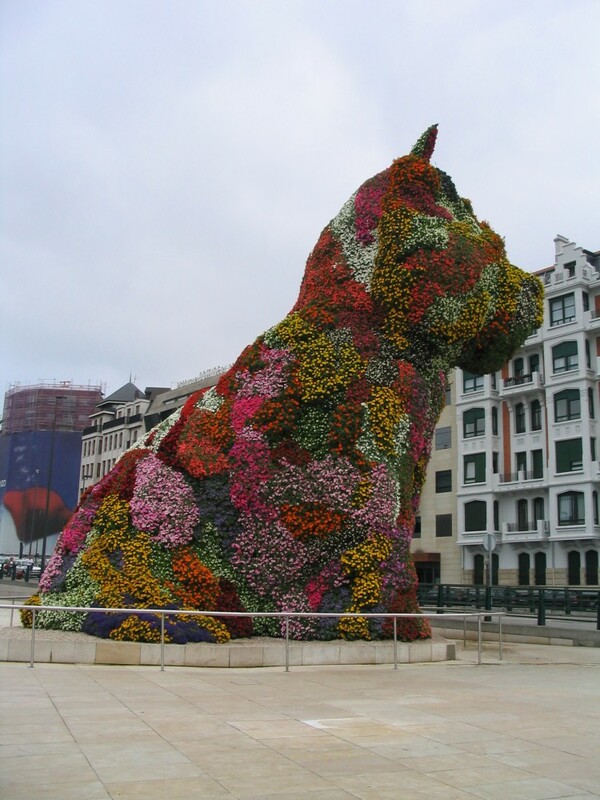 A few years ago, I visited Bilbao, and I found almost as much delight in seeing Jeff Koons’ subversive and witty giant ‘Puppy’, as I did from the setting of Frank Gehry’s famously sculptural Guggenheim Museum. Koons plumbs the depths of kitsch, and reinvents it as an art form, and ‘Puppy’ was a 13 metre high monster, meticulously planted out with 70,000 annuals in an impressionistic style picking out the features of a West Highland white terrier. 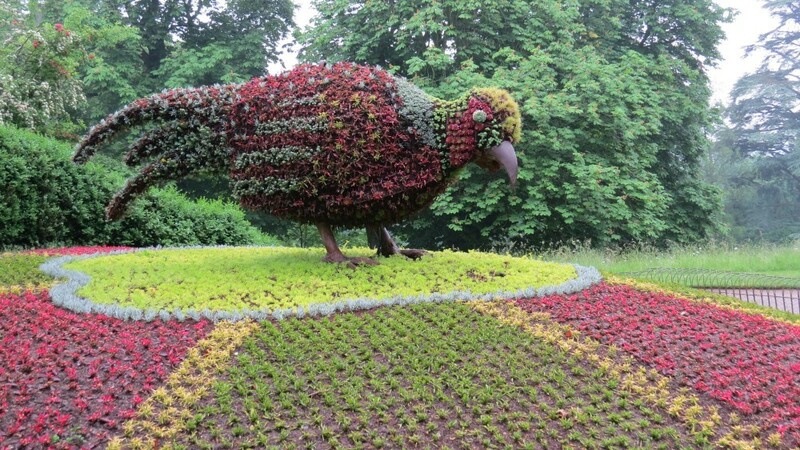 I loved it, but it reminded me of Waddesdon Manor and its sad carpet-bedded birds. I’m sure Koons would appreciate the gardens of Waddesdon Manor, where each year the National Trust chooses a different designer and a different theme for its fanciful carpet-bedding. Wouldn’t it be wonderful to bring him in as a consultant on next year’s design? 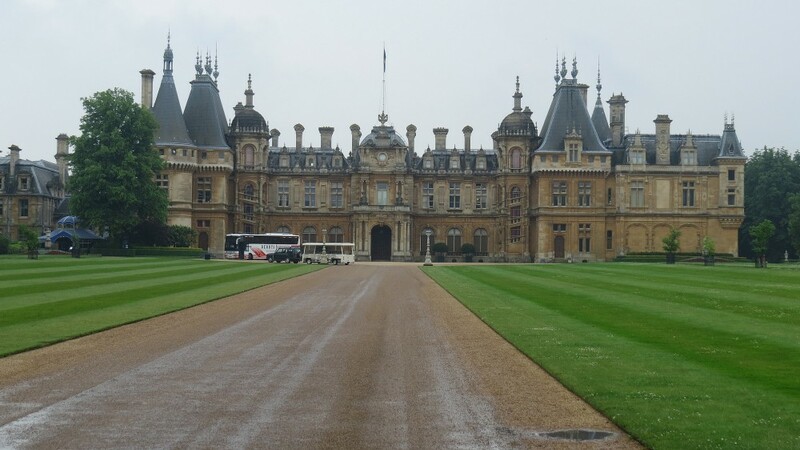 Everything about Waddesdon is grand and over the top; the Manor being a substantial and very solid-looking late 19th century Disneyesque palace, an unrestrained compilation of design features from several chateaux of the Loire Valley. A National Trust property, it is run semi-independently by the Rothschild Foundation who has continued the family tradition of adding to the fabulous collections of English and Dutch paintings, Sevres china, French furniture and Renaissance sculpture, and of developing the gardens and estate. The Foundation is a very active and generous charity, which in addition to funding the restoration and development of Waddesdon, has made substantial donations to numerous arts, conservation and heritage projects. Waddesdon’s most impressive garden feature is the three-dimensional Parterre, bedded out twice a year, on the south front of the Manor. 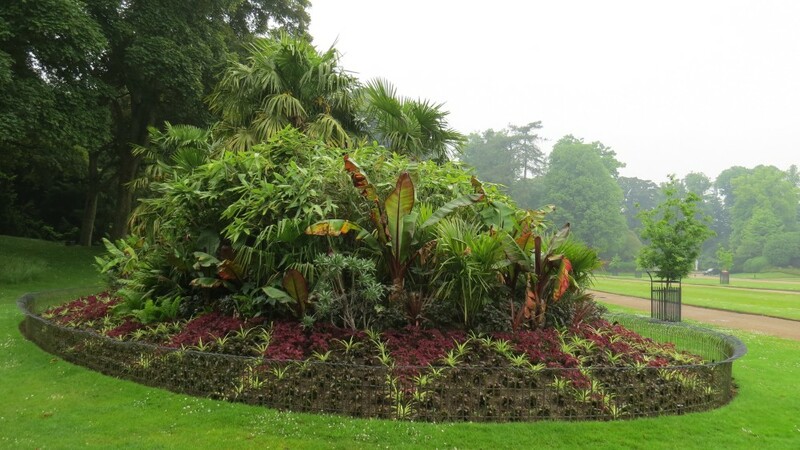 Last summer, 2013, garden designer Philippa Lawrence laid out the two large beds on either side of the grand fountain (dating from 1700 and brought from a ducal palace near Monza) with 23,000 plants, the theme being based on a very restrained piece of 17th century chinoiserie Brussels lace. Carpet-bedding is a hugely labour-intensive form of gardening, both in terms of setting out the plants, and in maintaining them in a crisp, perfect condition, and the National Trust is one of the few organisations that have the resources to fund it. Unfortunately however their primary concerns are historical accuracy and injecting some good taste into carpet-bedding. 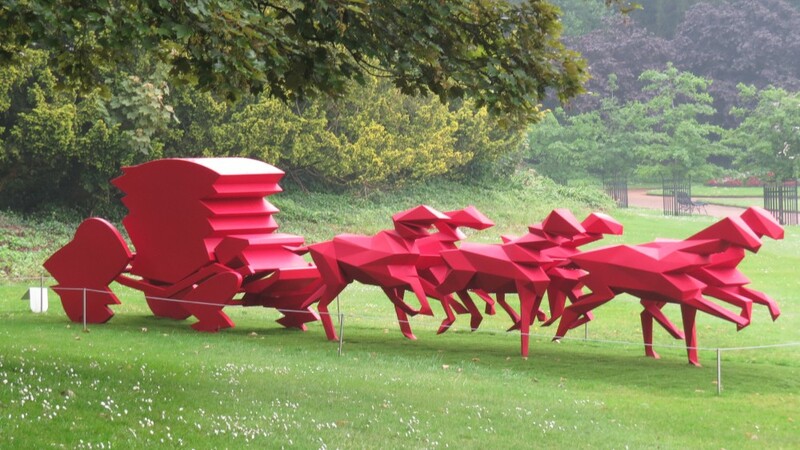 But if the Rothschilds can put a fun piece of red modern sculpture (‘Carosse’, a modern take on coach and horses) on the front lawn to the Manor, why shouldn’t the Trust be a bit bolder with the carpet-bedding? Take a look at the photograph of one of Waddesdon’s rather sad giant birds, and I think you’ll see why we should give Koons a go. Perhaps these could be teddy-bears or baboons, and the diminutive Tropical Mound, planted out each summer, could prove to be a great location for ‘Puppy’. 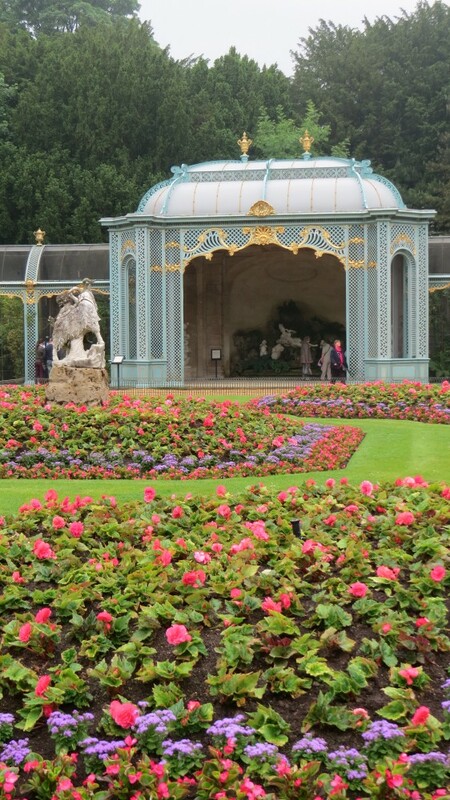 Waddesdon’s other carpet-bedded garden is laid out in the front of the Aviary, a late 19th century gilded and trellised rococo style building restored in 2004, although here the bedding is more two-dimensional. 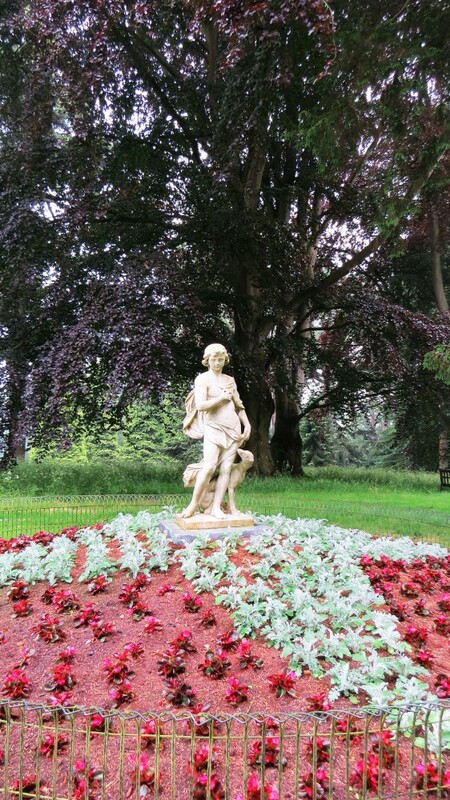 Probably ‘Young Boy with Hound’ set against a vibrant copper beech and anchored in a star of carpet bedding exemplifies Waddesdon’s style most succinctly. There are other garden areas at Waddesdon such as the Rose Garden recently replanted with David Austin roses, but it is the carpet-bedding that marks Waddesdon out as exceptional, especially now that municipal and particularly seaside councils have moved on to a more grassy, lower maintenance style. Interestingly the 49 page brochure on Waddesdon Manor pays scant attention to the garden, visitors coming to see the amazingly good collection of 18th century painting, china and furniture; but the exuberant immaculately maintained garden is our best exponent of the continuing tradition of Victorian carpet-bedding. Not to everyone’s taste, but like Las Vegas, everyone should see it at least once.